Located in the heart of Gifu Prefecture in the central Chubu region of Japan, Seki is a city of 90,000 people with deep history, rich heritage and abundant nature. Among the Japanese, Seki is renown for its crisp, clear water which runs from the mountain tops into the Nagara river, as well as for its fresh and flavourful produce and rice. In the area, you will find the best essential ingredients for good cooking such as 10-year matured mirin in Kawabe-cho, authentically made miso in Gujo, and traditionally fermented soy sauce in Gifu city. These staples of Japanese cuisine are all produced by long-established family-run businesses whose focus on tradition and quality attracts the business of top chefs in Kyoto and Tokyo. Not to mention, the area also boasts excellent authentic sake producers, whose delicate brew make an exquisite accompaniment to any meal. 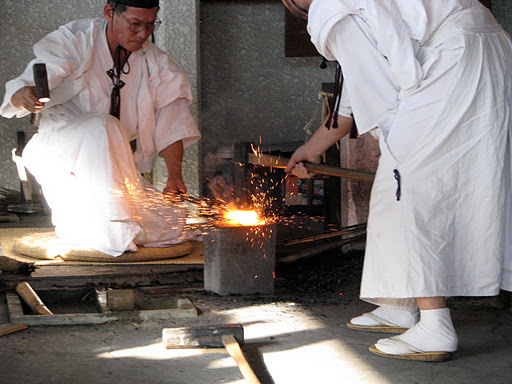 Worldwide, Seki is famous for production of fine knives and swords. Even today, sword smiths expertly forge blades using traditional techniques that have been passed down for centuries. Visitors are encouraged to catch an authentic demonstration of the process at the Sword Museum located in downtown Seki. In the summer months of May through October, Seki is also the site of traditional cormorant fishing (ukai) along the Nagara river. Ukai is an ancient fishing method dating back 1,300 years and it is still practiced today using the same techniques. The cormorants are handled by their masters (usho), who wait until after dark to set the birds on their prey—ayu (sweetfish). On a clear summer night, a natural stage is set with moonlit mountain peaks looming in the background, blazing torches illuminating rustic wooden boats in the placid, crisp water, and skilled usho expertly guiding the cormorants—this ceremony transports onlookers back in time. Seki is also an excellent destination to learn about the finer aspects of traditional Japanese culture, without the high price-tag that usually accompanies such endeavours in the larger hubs such as Tokyo, Kyoto or Osaka. Having lived in Seki for generations, the Ozekis have an extensive network of craftsmen, artisans, farmers, fishermen and historical experts, who can provide authentic cultural experiences ranging from tea ceremony and rice cultivation, to sake brewing and calligraphy. Such outings are all available in conjunction with Chef Shuji's cooking classes. For a full listing of combined packages, please consult the bottom of the Cooking Classes page. Seki is located in Gifu Prefecture, in the central Chubu region of Japan, about 50km from Nagoya. Nagoya is accessible from Tokyo and Osaka by shinkansen bullet train, plane, bus and car. If arriving by plane, you will need to take the JR train to Nagoya in order to board the Highway Express bus to Seki. If arriving by shinkansen, you will simply transfer to the Highway Express bus at Nagoya Station. Please note that although you can take the JR train from Nagoya to Mino-Ohta and change trains to Nagaragawa Railways to Seki, there are many transfers involved and unless you have already rented a car, the Highway Express bus is the most efficient option. The nearest bus stop is Fushimi-cho, not Meitetsu Bus Center at JR Nagoya Station as currently published in Lufthansa layover magazine. We have not yet updated the old information in your layover magazine. About 5 minute walk from Hilton brings you to Fushimi-cho bus stop of highway express Gifu bus. Please catch 12:50 highway express Gifu bus and the bus will bring you to Seki Kittamachi stop at 14:17. Shuji will meet you at Kittamachi bus stop. The Centrair Airport, south of Nagoya, is located about 80km south of Seki. The instructions below outline how to get to Nagoya Station. Afterwards, you will transfer to the Highway Express bus which will take you to Seki (see instructions below). Meitetsu train: 870yen (one way). Please buy a ticket at the Centrair train station and keep the ticket for the duration of your trip. Once you have collected your luggage, please follow the signs to the adjacent train station. Buy a ticket for Nagoya Station, and board the Meitetsu Limited Express heading towards Nagoya. After 28 minutes, you will arrive at Nagoya Station where you will need to transfer to the Highway Express bus as instructed below. Cost: 1,130 yen per person one way. Fare collected upon arrival to Seki—no need to purchase tickets before getting on the bus. The bus driver will not be able to make change, so please ensure you have the exact fare before boarding. Boarding area: The bus stop is a 5 minute walk from JR Nagoya Station, on the 4th level of Meitetsu Bus Center building. At gate 23, you can catch the Highway Express Gifu bus or Meitetsu bus bound for Seki-Mino. The bus brings you to Seki City Center where you will get off at Seki-Kittamachi bus stop. If Shuji isn't busy with preparing for your arrival, he will gladly meet you at the bus terminal. Otherwise, please follow the steps below. After getting off the bus at Kittamachi bus stop, follow the bus for about two minutes on foot (about 100m) and across the street to your right, you will find a sign in English saying Ozeki Cooking School. If you fail to get off at Seki-Kittamachi—no worries!—stay on the bus and get off at the next bus stop Seki-Nakamachi. Just walk back the way you came for about 100m and you will find us to your left. Please note: There is a bus stop in between Seki-Kittamachi and Seki-Nakamachi, however the Highway Express buses do not stop here. For Highway Express bus schedule please click here. The schedule isn't offered in English, so please set your browser into translate mode. Shuji can help you find your bus schedule.